Fifteen miles from Atlanta, 3200-acre Stone Mountain Park is Georgia's number-one tourist draw: it combines natural attractions (woods, lakes, and the famous "stone mountain") plus man-made amusements such as sky ride, scenic railroad, old-fashioned town, and a laser light show. About that Stone Mountain: it's the largest outcropping of exposed granite in the world, and part of it's carved with the world's largest sculpture, a gigantic Confederate Memorial. 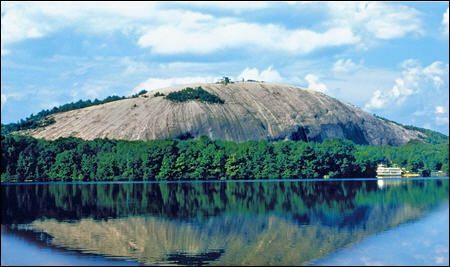 Read more about Stone Mountain and its history. play zones: Treehouse Challenge; 1870's "Great Barn" with four floors of rope nets, mazes, slides, etc. The Stone Mountain Inn, managed by Marriott, is located in the center of the Park, and is billed as a "carefully preserved replica of a nineteenth century plantation". Check for Family Packages that include attraction passes at Stone Mountain Park. Families can also stay at the family-friendly Evergreen Marriott Resort at Stone Mountain Park, which likewise often has family packages that include Park attractions. Be sure to check recent visitors' comments at a site like TripAdvisor.com, for comments about meals, charges within the park, etc. Many visitors comment about crowds and line-ups, during popular times for family visits.